Free hotspots are widespread in South Africa. In Africa, the trend is towards providing citizens with free Wi-Fi in order to boost economic activity and education, in line with McKinsey’s projection that if internet penetration grows in the same way as that of mobile phones on the continent, it could contribute as much as 10 per cent – $300 billion – of the continent’s total GDP by 2025. The provision of free Wi-Fi is becoming a continent-wide trend. In Kenya, the county of Nakuru is offering residents free access through a partnership between the State House Digital Team and the county government, at the reported cost of US$2 million. Rwanda’s Smart Kigali initiative provides designated free Wi-Fi hotspots around the capital. The Murtala Muhammad Airport Two (MMA2) in Lagos provides free access for passengers through a public-private partnership, while Nigerian operator Visafone has launched a free service for its customers in stores across the country. However, South Africa is way ahead of the rest of providing free access to citizens, with both the public and private sectors assisting in rollouts across the country. Free hotspots are so widespread that a website has been set up to display all the free hotspots in the country. The site currently lists more than 2,000 spots in 60 cities, in a country where universal access is a high-level concern and Wi-Fi plays a crucial role. Even the notoriously untechnical ruling party the African National Congress (ANC) thought to include free Wi-Fi access as a plank in its election manifesto, while local governments and private companies are initiating rollouts. The reasons for these rollouts are clear, according to Alan Knott-Craig Jr, who runs Project Isizwe, a non-profit organisation that now has deployments in three South African municipalities, serving 20,000 people in Robertson, 20,000 in Atlantis, and 1.15 million in the City of Tshwane, with the latter also set to see the deployment of network capacity for a further 2 million users in its townships by May next year. “The World Bank says that for every 10 per cent of broadband penetration a country’s GDP grows by 1.28 per cent,” Knott-Craig says. “More tangibly, free Wi-Fi in townships allows the unemployed to look for jobs online and email CVs. Without internet access how do people find out about jobs or submit CVs? 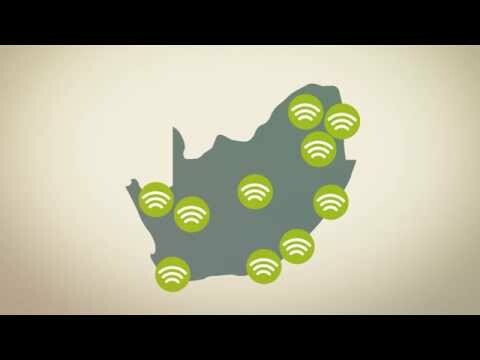 After the initial high-profile rollout in Tshwane at the end of last year, Project Isizwe subsequently partnered with the Western Cape government to launch its free service in Robertson and Atlantis, part of a ZAR1.3 billion (US$122 million) plan to connect the whole of the province to free internet. “Residents of Atlantis will now have an opportunity to connect to the internet to access a range of opportunities including finding jobs, start and expanding businesses and completing school projects,” said Western Cape premier Helen Zille at the launch, while minister of economic opportunities Alan Winde said the project was an attempt to tackle the high cost of bandwidth, which had previously restricted internet access for many South Africans. Knott-Craig believes government commitment to the rollout of free Wi-Fi is pivotal. He said a number of different trends have resulted in the sudden surge in political support for free Wi-Fi hotspots. The private sector is also playing a role in South Africa, however. Internet service provider MWEB has been providing free Wi-Fi in various locations across Cape Town, as have local startups Skyrove and e-Mbizo, while Project Isizwe itself has partnered with classifieds platform Gumtree. Knott-Craig says internet break-out providers such as Neotel and local wireless internet service providers (WISPs) are the key participants. Knott-Craig testifies to the increasing trends towards free Wi-Fi provision in South Africa through the ease with which his organisation is now able to obtain funding and partners in rolling out free hotspots across the country. “Originally Isizwe was funded by myself and my partners, at risk, on the basis that we promised to deploy free Wi-Fi in townships at a certain price, and if it didn’t meet the municipality’s expectations they didn’t have to refund us,” he said.